This post is part of a three-part series about using the Clang AST Matchers to mechanically refactor C++ code. In the last post, we ensured that the code is at least buildable with Clang. While that part was only interesting to those whose code was not yet building with Clang, the rest of the series appeals to a general C++ audience. There are many other resources on the internet covering use of existing clang-tidy checks and their motivation, such as my previous employer. There is very little information online about the developer workflow and tools to use when creating custom extensions for source to source transformations with clang-tidy. This blog series aims to fill that gap. Let’s start with intent and motivation to get everyone on the same page. Imagine we wish to rename the time() method on the QDateTimeEdit class to value(). We could start with using a simple find-replace to transform all instances of the text time in our code to value. This will obviously change too much – variables or class members named time which are local to functions will be changed to value for example. We could try to refine our pattern to find expressions which look like calls to time() and convert only those to value(), but that leaves the problem that other classes with a method named time() would be affected, even though we don’t want that. Occurrences of time() in strings and comments would also be affected, even though we may or may not want that. We only want to change the method on one class and its subclasses, and all relevant callers. One strategy would be to make the change in the QDateTimeEdit class header and try to build the code, fixing any method calls as they are reported as build errors by the compiler. Anyone who has tried that method knows that it doesn’t scale, so we try to automate it. If the name of the method we want to port is unique enough, a naïve approach with a find-replace script can work. Even with methods which have common names, modern developer IDEs offer features for some semantic porting, so the example is a bit contrived. However, we can come up with examples which are not so generic that they are built into IDEs. This is compelling because it requires less programmer time to create such tooling than to directly attempt to make the changes in the source code. Coding practices change over time as do the people advocating them! Even a well-maintained codebase will have constructs which are worth changing if it is old enough. Let’s follow the steps that a C++ developer would take to create a new clang-tidy tool. We’ll follow the spirit of ‘dive in’ and see how far we can get with basic concepts, extending our knowledge as needed. This means we will gloss over some code, APIs, command line options and concepts where they get in the way of what we are focusing on. It is possible to create stand-alone tools based on clang, but in this case, extending clang-tidy itself provides several advantages, such as test infrastructure and existing build system. However, because clang-tidy does not support external plugins, we are currently required to build llvm, clang and clang-tidy from source. It is important to ensure that clang-tools-extra is cloned to a directory called extra, as the build system relies on that. clang-tidy can be used both to check for issues about code and to actually implement source-to-source transformation. Extensions to it are simply called checks in the documentation and in the extension API, but those checks can be responsible for more than just “checking”. The development loop for creating a clang-tidy extension looks something like the image below. We start by creating a new clang-tidy check. 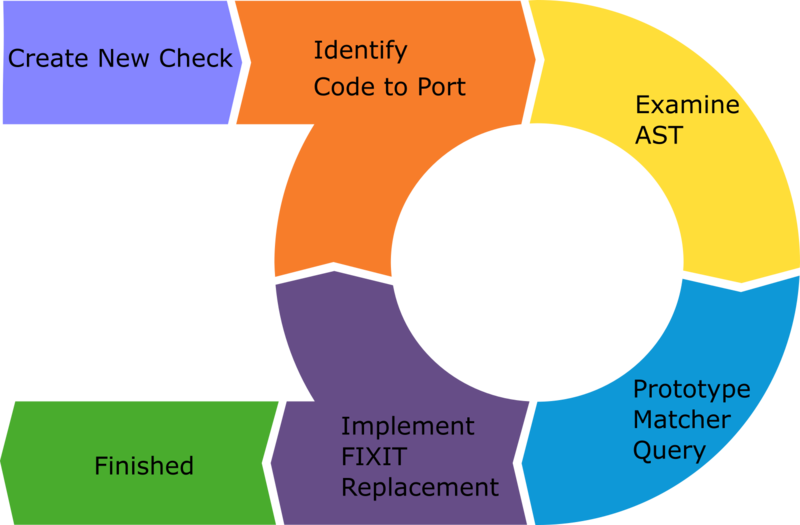 We then examine the Abstract Syntax Tree to determine how it relates to the source code, prototype a Matcher to process the AST and use the Clang FixIt system to replace patterns in the source code. This process is iterated until all relevant patterns are ported by the tool. We will cover all parts of this process as we progress through the blog series. Once the LLVM/Clang build has finished, we can run the create_new_check.py script in the clang-tidy source to generate code for our porting tool. This generates code in the clang-tidy source. Examining the source of ./misc/MyFirstCheck.cpp, we can see that it adds the prefix awesome_ to functions which do not already have it. Examining ./misc/MiscTidyModule.cpp, we can see that our new check is registered in the tool with the name misc-my-first-check. The -checks option accepts a comma-separated mini-language which is used to enable and disable checks to run on the specified source file. clang-tidy has several checks which are enabled by default. The -* part disables any default checks, and the misc-my-first-check part enables only our new check. Further information about enabling and disabling checks is available in the clang-tidy documentation. The two dashes trailing the command are used to silence a warning about missing compilation database. Additional compile options, such as include directories and pre-processor definitions may be specified after the dashes if needed. clang-tidy.exe -checks=-*,misc-my-first-check -fix testfile.cpp 1 warning generated. testfile.cpp:2:6: warning: function 'foo' is insufficiently awesome [misc-my-first-check] void foo() ^~~ awesome_ testfile.cpp:2:6: note: FIX-IT applied suggested code changes clang-tidy applied 1 of 1 suggested fixes. clang-tidy applied 1 of 1 suggested fixes. So, clang-tidy reports that it changed our source file, and if we check, we will see that the testfile.cpp now has updated content! If we run clang-tidy again with the -fix option, we will see that the void foo() function definition was ported but the call to foo() was not ported and the result does not build. This may be obvious to some readers – declarations of functions are different to uses or calls of functions. The code auto-generated by the create_new_check.py script is not sophisticated enough yet to make code totally awesome. The next blog post will explore how Clang represents C++ source code. We will then be in a position to extend this new tool to also port the function calls. What kinds of mechanical source transformations do you intend to implement in your codebase? Let us know in the comments below or contact the author directly via e-mail at stkelly@microsoft.com, or on Twitter @steveire.